Habitat for Humanity welcomed two families into their new Habitat homes today at a celebration in the community of Redstone. In addition to being affordable, the homes are also accessible to meet the needs of children in each of the families. Habitat was joined by many of the sponsors, suppliers, government supporters and volunteers who all had a role in the completion of these homes. The Government of Alberta contributed significantly to the construction of these homes, and Karen McPherson, MLA Calgary Mackay-Nose Hill was in attendance to bring greetings and offer support on behalf of the Province, Premier Rachel Notley and Minister of Seniors and Housing Lori Sigurdson. Jeffrey, Suzanne and their five children Autumn, Zoe, Carmella, Finley and Jacob are one of the two families who will be purchasing and moving into their new Habitat homes on November 15. 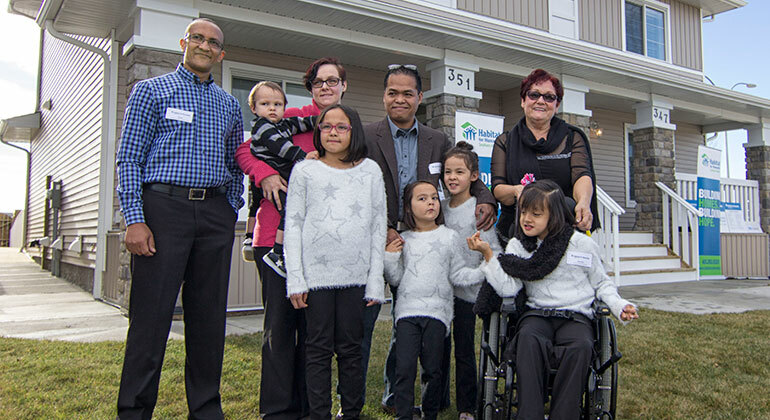 The accessible features, including ramps and a barrier-free main floor, will allow every member of the family to be comfortable, safe and secure in their new home. Habitat homes are the result of collaborative community support. Along with the Government of Alberta, Qualico Communities and ATB Financial have been generous supporters of these homes, in addition to many local trades and suppliers that step forward to donate building materials and labour. Six thousand volunteer hours were also logged to aid in the construction of these homes. Affordable home ownership builds long-term stability and self-reliance, empowering families to invest in their futures and creating lasting benefits for their children. Each family has worked to build their homes, and will purchase them with affordable mortgage of no down-payment, no interest, with monthly payments set to their income level. This will give them the financial stability to make other important investments in their families’ futures. These six homes are part of several developments Habitat is currently working on. Other projects include 24 homes in Pineridge, six homes in Ravenswood, five homes in Bowness and several upcoming developments in Calgary and across southern Alberta.